Court Reporting and Captioning At Home. 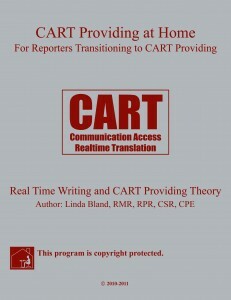 Transition to a Career in Broadcast Captioning or CART Providing. CRAH is pleased to announce it has partnered with Auburn University to offer Professional Development Programs in Realtime Court Reporting, Captioning, and CART Providing for Current Court Reporters as well as New Students. Train with us through our partnership with Auburn University and receive 18 months’ DEFERRED payments for those who qualify through private educational lenders. 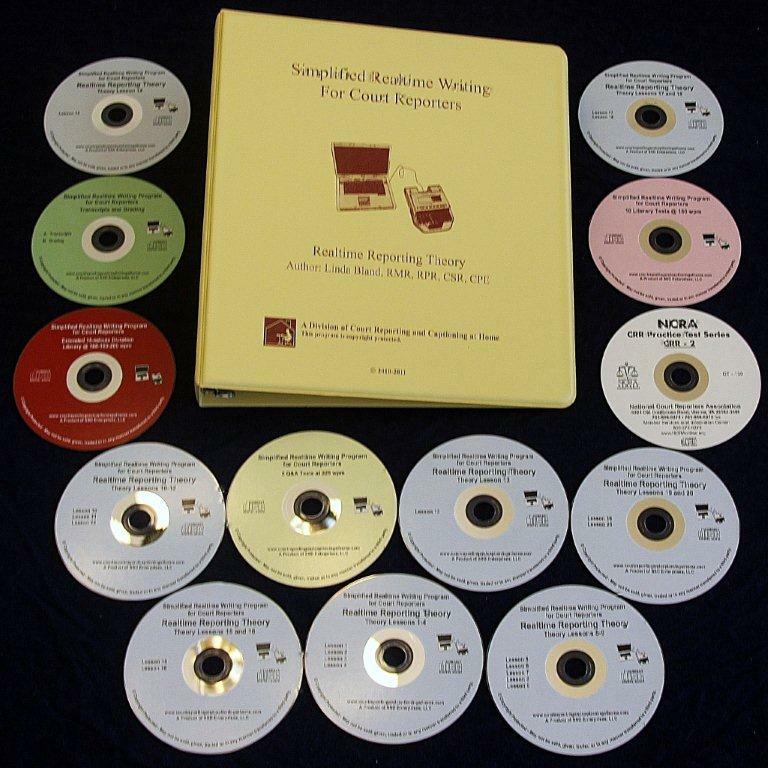 Now Earn 1.0 PDCs (CEUs) with NCRA-approved Realtime Writing Programs. Realtime Court Reporting, Captioning, and CART Providing. Upon completing the CRAH Captioning course I submitted my first and only resume` by e-mail to a company which was my top choice for employment. I received an immediate response, and I was offered a position over the phone. No more fighting traffic, no more driving in storms, no more transcript deadlines. My official work attire is yoga pants and t-shirts. I almost can’t believe this is happening. I took a leap of faith. I began the CRAH Captioning course in March, and by December I have a full-time job. I have to pinch myself! Yes, I made it! You can, too. My only regret is that I didn’t do this 10 years ago. 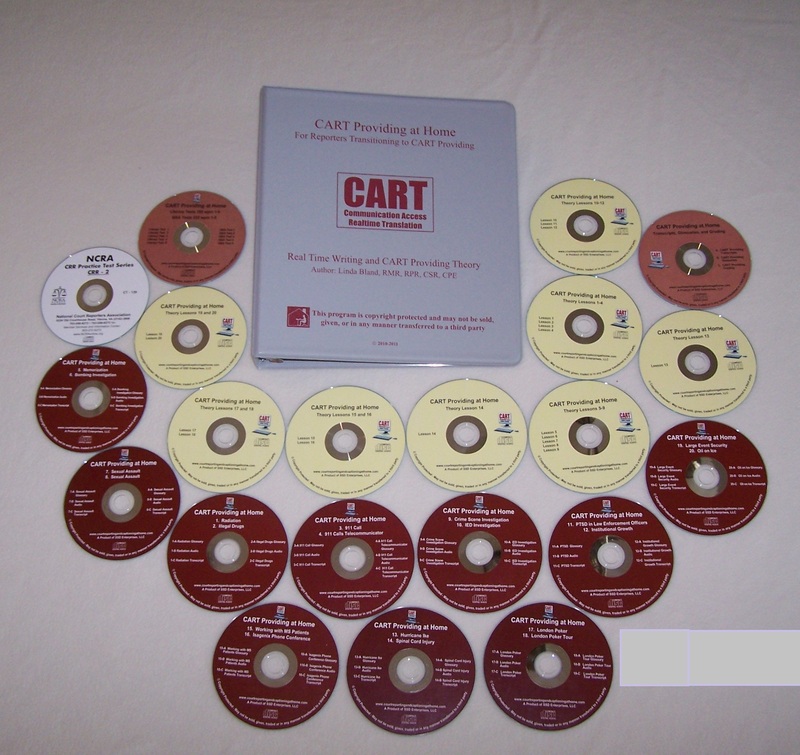 “Because of the CRAH training program, I am now working professionally as a CART Provider, and I LOVE IT!!!! It is really a dream come true for me! I am having so much fun. Your realtime program is working really great. It feels as if you are right there in the room with me. The lessons are easy to understand, and I can already see a difference in my writing. And the speed building materials you furnished me really helped. I passed the RPR!! I just wanted to let you know my realtime writing is progressing really well. Thank you for the program!!! I see the results in the amount of time it takes me to edit a transcript! Can you imagine how much faster it will be once I’ve completed the whole theory manual?!? Just to keep you up to speed, I was elected Employee of the Quarter, then Employee of the Year. Then to top it all off, yes, I am now supervisor of the division!!! I thank you for all your kind words and encouragement. I can’t say enough about the theory manual and how it was put together. It’s easy. I’m learning, and it’s a stress-free way to learn realtime. Thank you, thank you, thank you. First of all I want to say thank you for the Court Reporting and Captioning at Home Captioning Program. After being a court reporter for 17 years I decided I wanted to transition into captioning. So I spent months writing the news every day and entering current event terms in my dictionary. After months of doing that, I was no closer to being able to pass an assessment to caption than I was when I started. So I began searching for some help and that’s when I found CRAH for Reporters Transitioning to Captioning and CART providing. I spent a couple of months working through the program and doing dictionary work using the glossaries that were provided with the program and rebuilding a little speed. I didn’t have to learn a whole new theory, just update mine with some realtime writing concepts to ensure my notes translated more accurately. I have started the program, and I’m very happy with it. I have added a lot more prefixes and suffixes to enable me to build words not already in my dictionary, which is key if your interest is in captioning. And I have learned to put inflected endings in a separate stroke. It took some getting used to writing inflected endings in a separate stroke in the beginning, and I still on occasion will forget when I’m pushed for time. Now, however, mostly I come back for the inflected endings, and I definitely see a huge improvement in my translation doing it this way. At first I didn’t like having to come back for the stroke, but now I can clearly see the benefit of writing in that fashion. 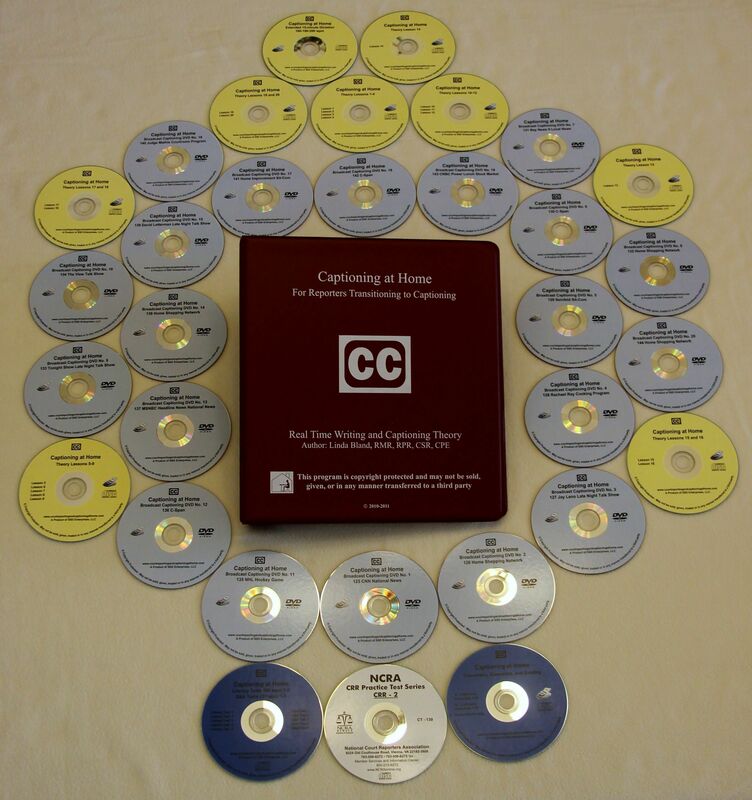 NCRA’s CBC (Certified Broadcast Captioner) What Constitutes an Error? NCRA’s CCP (Certified CART Provider) What Constitutes an Error? 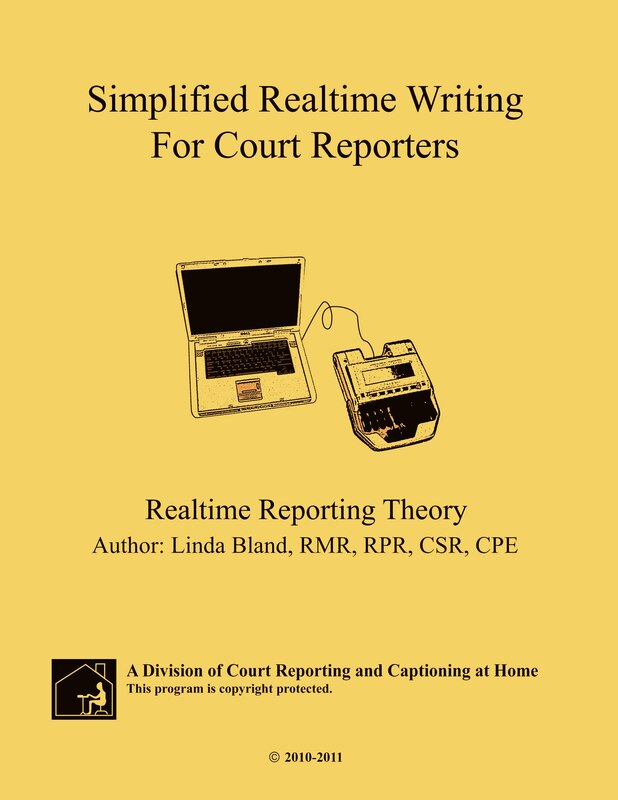 Are you a Court Reporter who wants to improve your realtime writing to be able to offer realtime in your court reporting career or to transition to either captioning or CART Providing? Well, welcome to CRAH’s comprehensive, self-paced, Broadcast Captioning and CART Providing distance education programs. So you’ve tried all the seminars, gone on the cruises, and still …you can’t translate proficiently enough to caption or provide CART services. It’s not surprising…and it’s not your fault. Are you an excellent court reporter, but when you write anything outside the legal field, your translation is less than stellar? Improving your writing by updating your theory cannot be accomplished in a weekend seminar or a week-long cruise. It takes methodical, structured, daily work incorporating realtime writing theory concepts. After all, you’ve been writing this way for years, and you cannot change your style overnight. But the good news is … you CAN change your style of writing to allow you to be an excellent realtime writer. Offering realtime will keep you in demand and ensure job security. Captioning and CART Providing at Home will take you step by step through the process to prepare you to enter these careers. This is a very structured program requiring just your motivation and discipline to practice. What Captioning at Home and CART Providing at Home offer you are OPTIONS! There isn’t one perfect captioning and CART Providing theory for everyone. However, you will find options that work for you and your style of writing. Think about it … If you resolved your top five major errors by incorporating realtime writing concepts, you would probably reduce your transcript editing between 75% to 85%. You will have the additional benefit of seeing your transcripts clean up and translate more accurately each day you learn a new realtime writing concept and incorporate it into your next daily assignment! How long it takes to improve your translation rate depends upon the amount of time you have available to practice and how much work is necessary to improve your writing. First, you must update your theory with some realtime writing concepts to be certain your notes translate more accurately. 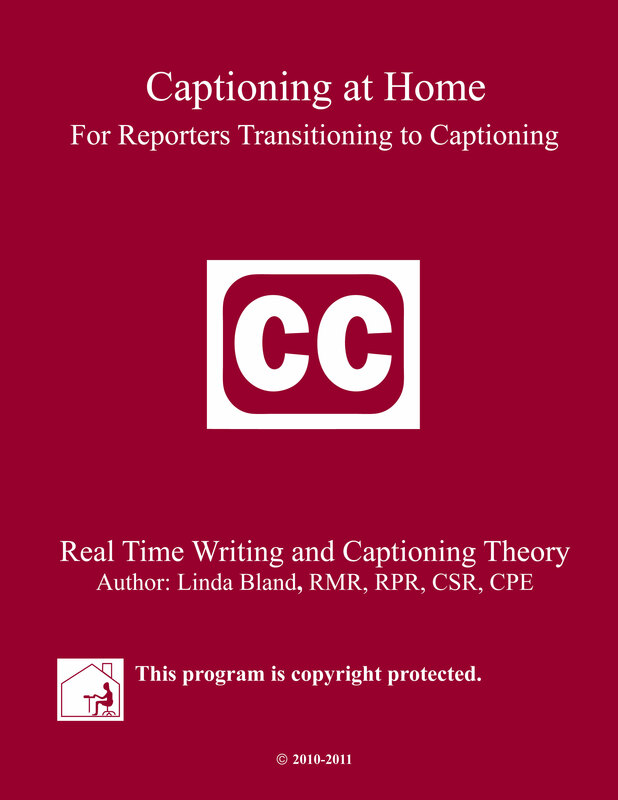 The “Realtime Reporting and Captioning Theory” is the only NCRA-approved theory developed specifically for home study students. It was actually named for me by Kathy DiLorenzo, past President of the NCRA, but more importantly to me, one of the most renowned captioners in the country, having served as a Vice-President of Vitac Captioning Company for over 20 years. She stated she felt I should name it something that would let students know that whether they wished to enter court reporting as a realtime writer, or broadcast captioner, or CART Provider that it would provide them with a realtime writing foundation for any of the three careers. You do not have to “start over” by any means, but it does require you to incorporate some realtime writing concepts that you have probably never had before. Updating your theory ensures your translation will improve exponentially with each added realtime writing concept. Evaluate your current realtime translation by taking a literary test at 180 wpm. Log this score into your Grading Chart for a point of reference. Now you know where to begin. Memorize the realtime writing concepts you need to incorporate into your old theory. Most programs and realtime seminars simply lecture to you about these concepts and illustrate them in a book, but the Captioning at Home and CART Providing at Home programs contain CDs with theory dictation drills for you to practice to help you incorporate these concepts into your daily writing. The CD dictation for theory lessons is extremely important, because you must hear these words repetitively in order to retain the theory concept in your memory. You can’t just look at them in a book. You must hear them and write them to ingrain them in your memory! Edit your steno dictionary to include these realtime writing concepts. Add glossaries of terms in your steno dictionary. The NCRA recommends approximately 30 glossaries, and we have done the work for you! You will receive all 30 of the recommended glossaries as well as 5 additional glossaries. This will save you many, many weeks researching these terms. Practice writing from captioning or CART assignments, testing yourself often to see the improvement in your translation. CRAH has various programs, and you may begin with less difficult programs and work up to the more difficult national news and home shopping programs. The CART assignments are varied from professors’ lectures to corporate meetings and various other assignments. Learn the “academics” about your career choice, i.e., what kind of hardware and software you require, what kind of employment is available, how to obtain employment, how to network, all the frequently asked questions you would like to have answered. I consulted with some of the most renowned captioners and CART Providers in the country to answer these kinds of questions. 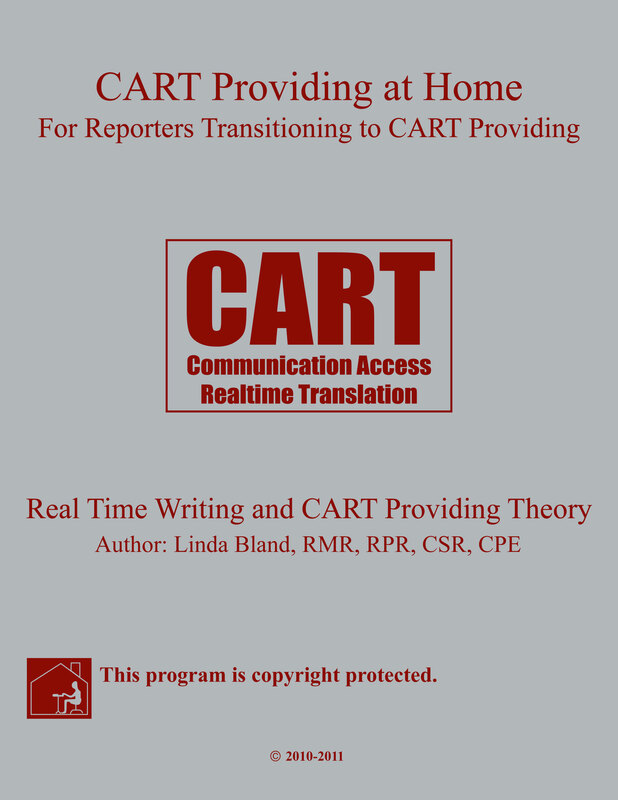 These programs contain “real” captioning and CART assignments WITH TRANSCRIPTS for you to practice writing as well as use for tests. Why are transcripts important? The NCRA recommends that you test yourself often. How can you grade your translation without a verbatim transcript? You can’t. Traditional schools and other programs simply recommend you record a television program with the captions turned on. However, if you’ve ever tried to proof/grade a transcript from television by stopping and starting the t.v. over and over again, you know it is almost impossible to do so. Additionally, captioners and CART Providers are allowed to summarize on occasion, and you might have written verbatim at a point where the captioner or CART Provider summarized, possibly counting those as errors when in fact, YOU had written it correctly. So it is just impractical, if not impossible, to attempt to grade your transcript from anything less than a verbatim transcript. And finally, and most importantly, you will have no idea how many words are in the transcript if you do not have a verbatim transcript. This is important to you, because in order to calculate your degree of proficiency, you must know the number of words in the segment you just wrote. To assist you with this, all the transcripts in the CRAH program are in Microsoft Word, and you simply highlight the first and last word you wrote, and using the Word Count feature of Microsoft Word, it will calculate how many words are in that segment. Then, utilizing a great little software program we developed, you can input the number of errors you made together with the total word count, and it will calculate your degree of accuracy for you! Have you lost a little speed over the years, or perhaps just need to gain a little speed? We have included extended literary dictation, 15-minute segments, at 160-180-200 wpm. We have included 5 literary tests in the Captioning at Home Program and 5 different literary tests in the CART Providing at Home Program for your use in evaluating your continual improvement and 6 realtime writing tests. You WILL be able to improve your realtime writing with the Captioning at Home and CART Providing at Home programs … and practice. You cannot complete this over night. Take one realtime theory concept at a time and master it, and then proceed to the next concept. Seeing daily improvement in your writing and translation is tremendous motivation to incorporate all the realtime writing concepts, but it is your choice how many concepts you wish to utilize. If you have additional questions, contact us at 877-253-0200. All CRAH programs are LICENSED TO THE ORIGINAL STUDENT for life. CRAH programs are licensed, NOT sold. Components of the program may not be sold, given, or in any manner transferred to another party. Once CRAH program components are shipped, they cannot be returned for credit or refund.